The famed Finnish textile brand Marimekko, renowned for simple, bright prints (and owing their original popularity in the US to Jackie Kennedy's Marimekko shift dresses in the 60's) has released their new spring collection, a nod to Finland's rich history. 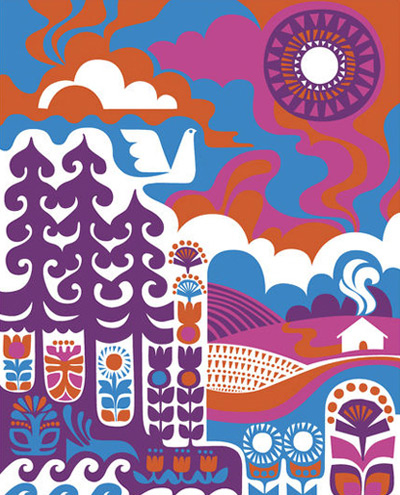 The Marimekko spring collection draws inspiration from Finland’s national epic, the Kalevala. The Kalevala's 22,795 verses have been credited with inspiring an awakening of the Finnish culture, ultimately leading to their independence from Russia in 1917. The fabrics are bright, bold, and in some cases narrative, depicting animals, landscapes, and the gears of change. Available in the US through Textile Arts.